AFMI began publication in 2011. Two volumes were published monthly on the 25th of every month. Each volume consists of six issues from 2011 to 2017. Since 2018, two volumes have been published bimonthly on the 25th of February, April, June, August, October, and December. Each volume consists of three issues. AFMI was published and distributed by Kyung Moon Sa from 2011 to 2017. Since 2018, it has been published and distributed by Research Institute for Basic Science, Wonkwang University, South Korea. AFMI is indexed by MatheScinet(for details) and Korea Citation Index. And it is an UGC approved journal(for details). 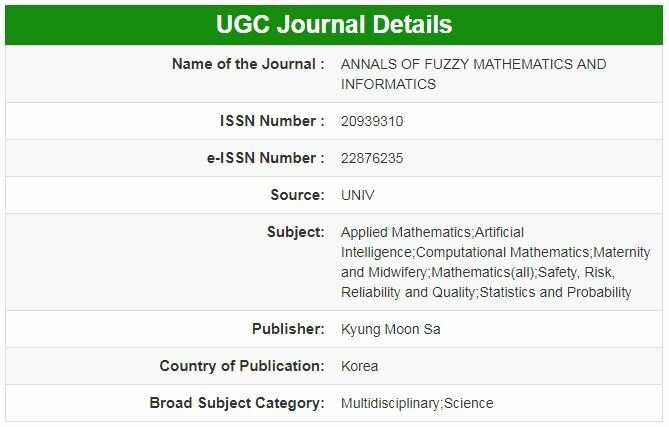 AFMI aism at quick publication of original research in the theory and applications of Fuzzy Sciences bases on Mathematics and Information Sciences. To ensure speedy the publication, only articles which are sufficiently well presented are refereed. This policy is in the interests of authors, as a quick rejection is better than a slow rejection. Editorial decisions on acceptance or otherwise are taken quickly, normally within a month of receipt of the paper. Papers are accepted only after peer review. Manuscripts are accepted for review with the understanding that the same work is not concurrently submitted elsewhere. Articles should be preparted in LaTeX using AFMI-class packages (See Preparation of papers below) and submitted as a PDF file. Authors are requested to submit their papers electronically to the ONLY one of Editors-in-Chief. The authors have to use the TeX Style Files for the final preparation of the accepted manuscript. Please download LaTex(2e) Macro style files(it contains sample file) which can be used to formulate your manuscripts into the journal style forms. If your paper contains graphs or figures which can not be processed even in LaTex(2e), make them EPS (Encapsulated Post Script) files. See the file sample-afmi.tex how to handle eps files. AFMI will request the LaTeX source code when the article has been accepted for publication or, in some cases, prior to peer review. Authors are advised to keep copies of all files of the submitted article; AFMI will not accept responsibility for any loss. K. Hur, H. W. Kang and K. C. Lee, Fuzzy equivalence relations and fuzzy partitions, Honam Math. J. 28 (2006) 291--315. J. N. Mordeson, D. S. Malik and N. Kuroki, Fuzzy semigroups, Springer, 2003. Ph. D. Dissertation, Hanyang University, 2010. Typesetting with LaTex (AFMI style) is subject to a page charge of $20.00 per typeset page. where n is the number of pages of the article to be published. If it is necessary to use "Individual hard cover", then plese make it by using following files. The corresponding author will receive a pdf proof by e-mail, and is asked to check this proof carefully and should send revised version with revision notes (if any). For the policies on the research and publication ethics not stated in this instructions, international standards for editores and authors(https://publicationethics.org/node/11184) can be applied.